What does that have to do with science of reincarnation? The science of reincarnation rests on the hard science our physicists are doing, but that information directs our social science that social science needs to be taught. It is a dense body of information that needs to reach disadvantaged people in at risk situations. It is the mission of this organization to propagate this science into the darkest reaches of the world so that there is a light of logic and reason to prevent aberrant ideologies from taking hold. This organization is not playing games with a musical presentation designed to attract attention by combining fiddler on the roof with the Rocky horror picture show and translating it at the 30 different languages. It is a political and social strategy that is being implemented with cognition and intent that we have no wish to hide. Simply stated here is the truth deal with it. Because it is a scientific truth that we are seeking it will change as we learn more but what we are learning is the most factual version of reality that there is. We seek to encourage artists and musicians to use our community and marketplace as a stage for their talents and we look to support their efforts. We offer to give those artists and musicians a global brand that they can benefit from and supports them. In that sense Transcendence is the baseline for this initiative. If you want to change the world the world has to be aware of you and sing your music and wear your T-shirt. In one sense we are asking the world to sing with us and then another we are bringing discordant frequencies into a harmonious whole. Come and sing with us, come and play with us, you’ll have fun. 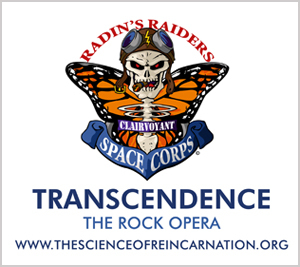 We are looking for musicians to record the rock opera. If interested, please contact us.